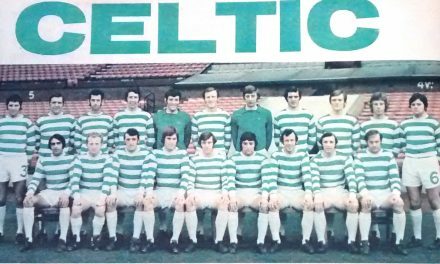 the only ones in the know after Jock Stein informed them in a pre match team talk. 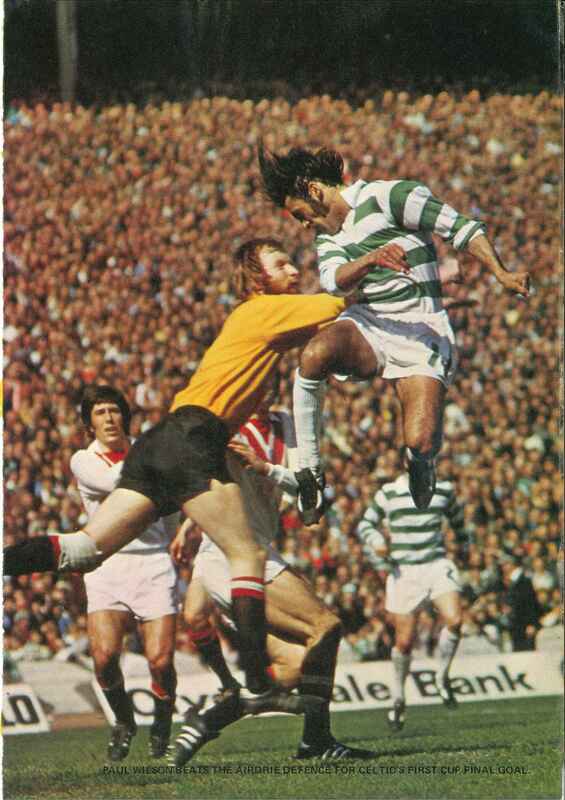 the awe we youngsters had of him. As for my Dad’s generation I can only wonder what went through their minds that night. They probably felt emotional as they recalled the glory days of 1965-75. 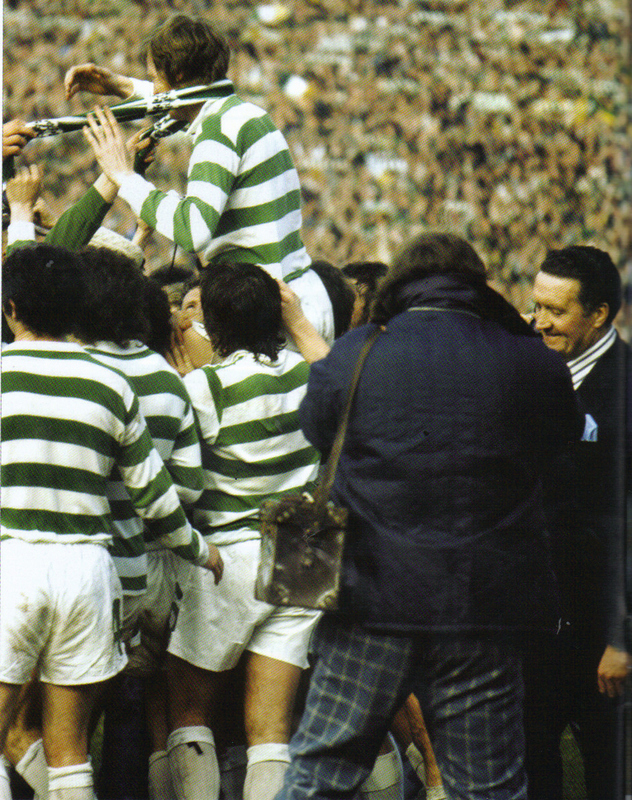 These men were the Celtic foot soldiers who had followed them faithfully during the difficult pre-1965 period and had now been rewarded royally in the past ten years. 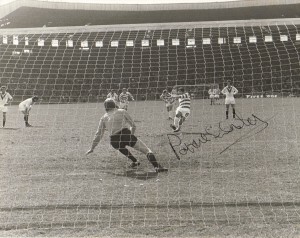 Inter, Leeds, Benfica, Red Star, St Ettiene and Fiorentina had all been put to the sword on memorable European nights and a plethora of Old Firm wins together with twenty four major trophies meant they had witnessed one of the most spectacular and successful eras in European football which McNeill himself had started with the winning cup final goal against Dunfermline in 1965.
unique stadium surrounding ever for a Euro final, an almost Romanesque amphitheatre and no emperor had ever stood more victorious or imperious after victory in battle as Celtic’s Caesar on that balmy May night in 1967. 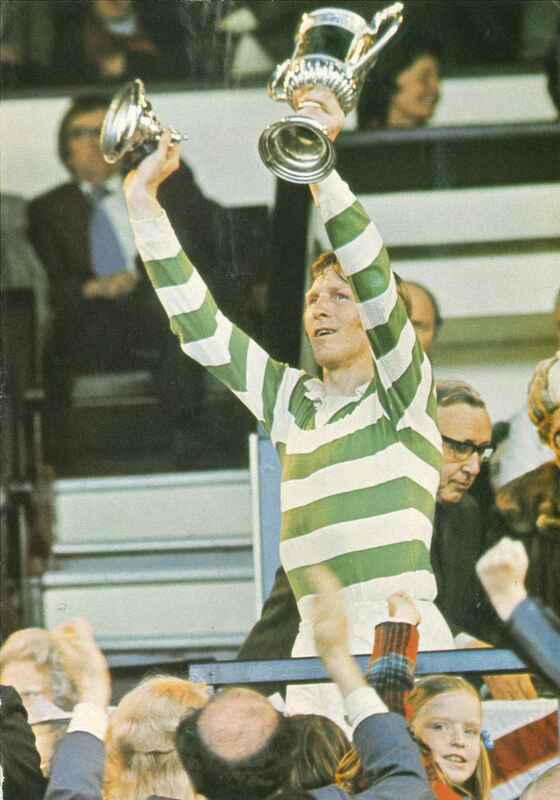 Hard to believe that the Huns had taunted us in the early 60’s by branding the inept Celtic team of the period as ‘Billy McNeill and the Easy Beats.’ Jock Stein was to ensure that there would be no more ridicule after 1965.
this game was a fitting end to a wonderful career as Celtic’s captain and leader. 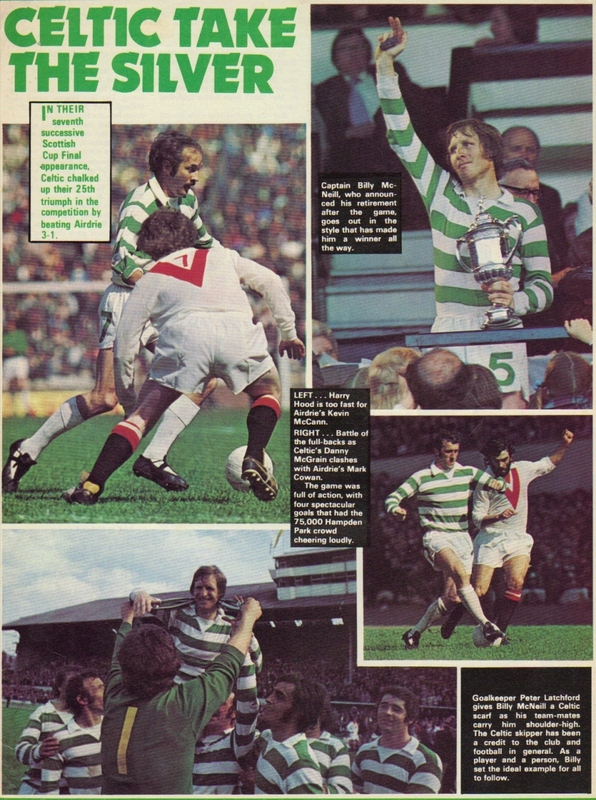 The first image is from Shoot magazine from May 1975 and shows some of the highlights from the game. 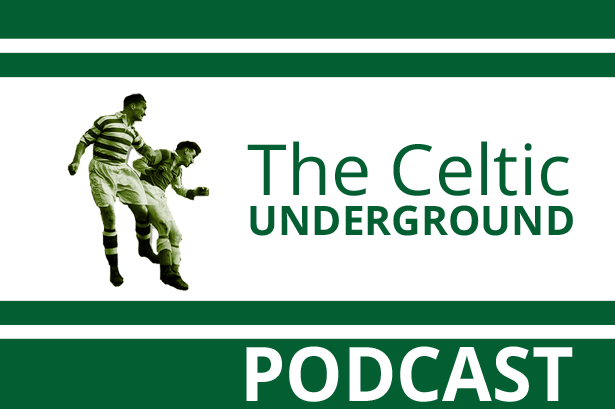 follow Celtic fanatically, home and away, in later life. I do have to say that I now have a ten year old boy who weighs a great deal, so for my Dad to keep me up for a long period when I was nine deserves great credit. Respect is due. 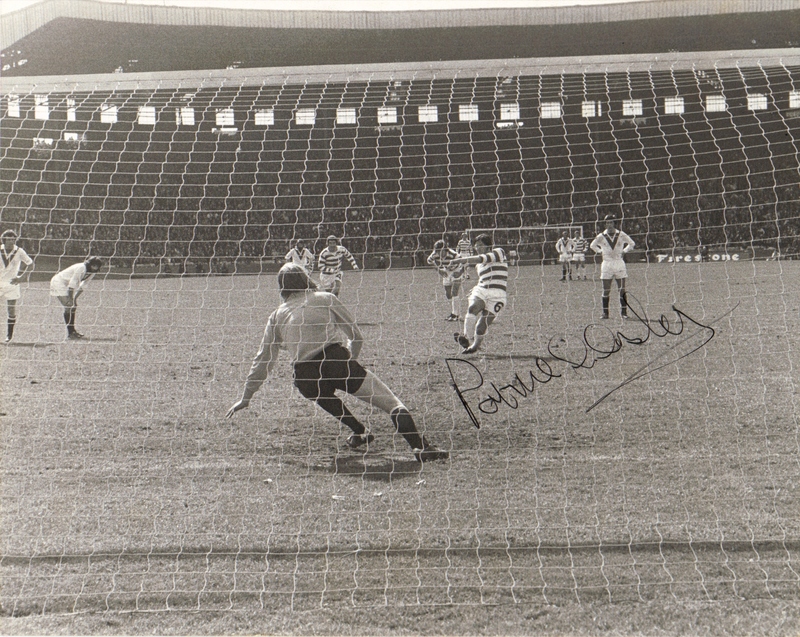 The third image shows Paul Wilson scoring his second goal. breed of Latchford, Lynch, Glavin and Wilson, who can be seen in these pictures celebrating their first winner’s medal as Celtic players.